Faith and Freedom Daily: Is Seattle's Own Bill Nye Really A "Science Guy?" Is Seattle's Own Bill Nye Really A "Science Guy?" The Seattle Times, in review of the "March for Science" formerly known as "Earth Day," noted that "In the DC march, it was Seattle's own Bill Nye the science guy who was the honorary chair." 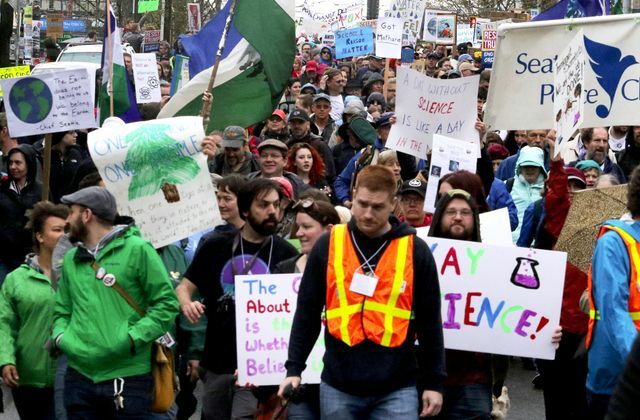 The march was to be about "science" but it may have created more questions than answers. Is Bill Nye, the national honorary chair, really the "science guy?" And was the marches really about science or politics, or as some are suggesting---a religious expression? Personal note to our readers: Thank you for your comments. However, we are receiving more and more in languages other than English. We will only post those written in English. Also remember, no direct links in your comments. Thanks. The Times says, "Crowds showed up in hundreds of similar marches around the world---and a dozen others in this state---as scientists feel besieged by what they see as a Trump administration disparagement of their work." Is disagreement the equivalent of disparagement? Apparently, it is. Nobel Prize co-winner University of Washington professor emeritus, Eddy Fischer, says, "I know very little about politics," as he marched with people carrying signs that read "Mr. President, science gave us Rogaine" and "Make America Smart Again"---demonstrating just how political the march really was. If you look at the pictures of the parades, you will note that most all signs are political in nature. There was a religious tone to the parades as well. Julie Smith, a marcher from of Mount Lake Terrace told the Times she "perceives an anti-science movement among politicians." When asked why she thought politicians were anti-science, she said, "I guess they play to their base, fundamentalist Christians." In an article titled, "The March for...What?" last Friday he said, "I am all for science. I think the climate changes. It always has and it always will. Yet I have been portrayed as anti-science and a climate change 'denier' by many who will be marching for things I certainly believe in." "Just who does not believe in science," he says--- "It's a straw man the marchers are marching against." In his article. he shares charts and graphs that "show no apparent linkage between CO2 and temperature in a time scale that goes back millions of years." He says, "I am instantly skeptical of the idea that after all this time, there is now a linkage. That does not mean there can't be, and I'm open to that argument and understand it. But...how much linkage is there?" "What I am trying to figure out is why there is a march when many of the people in that march have no tolerance for the questioning of their position. While I think it's noble to be inclusive and diverse, are any 'skeptics' included as speakers?" He says, "Questioning of dogma need not apply. That sounds more like a religion than science. If global warming is such a done deal, why are we researching it anymore? Actual settled science (freezing and boiling points of water, gravity, the sun is hot) is not being researched. So apparently AGW is not settled science. And for good reason---if it is true this is all man-made, it's the first time, established by science, in recorded history. Another reason for being skeptical." Bastardi says, "Finally, there seems to be a mass denial (there's that nasty word again) that the progress of humans, and of course researchers, has been huge in the fossil fuel era." He says, "The assumption that this would not continue makes no sense. In addition, a vibrant economy seems to be a moral and ethical positive." And regarding the money---billions in grant money from the government that the progressive left fears will evaporate in Trump's administration: Bastardi says a vibrant economy produces more not less opportunities for research. "Would you rather get 10% of 50 or 15% of 10?" he asks. While it is a bit of an exaggeration he says, it makes the point---"The population curve and the increase in GDP and life expectancy says to me the pie is expanding and many new challenges that need researching are going to continue to challenge people. And science will have to meet the challenge." It seems to an outsider like me that so-called "science" is obsessed with what they want to believe about global warming/climate change and have found a fountain of billions of dollars from the progressive Left to research what they claim on one hand is settled science and not to be questioned---while claiming on the other hand we must act now with more research, a.k.a. "dollars" to fund the billion dollar buildings they have built in recent years to "research climate change." I'm not a scientist, but I know a bit about religion---and cults. Having been a youth pastor during the 1960s and into the 1970s in places as diverse as Seattle, Salem, and Hollywood, I've seen cult leaders prey on kids who were desperately confused. There is an undeniable pattern in the way cult leaders operate. They state the "truth"---their self-serving truth--- while attacking anyone who disagrees or questions their truth while taking steps to sever all links between the kids they are misleading and the family members who love them. The kids in the cults are then dispatched to participate in all kinds of schemes to make money---which goes to the leader. I think Joe Bastardi is right. This great march looks more like a religion of some kind than science. It only seems fitting then, that Bill Nye the Science Guy would be the honorary chair of the march. The people at Media Research Council have looked into just how much of a science guy Bill Nye really is. It's not surprising what they discovered. They discovered that Nye doesn't mind the idea of jailing people who are skeptical of the man-made global warming hypothesis. They publish an interview where Nye is "agreeing with Robert Kennedy's call to jail climate skeptics for treason and lock them up..."
And they discover that Bill Nye may be a children's TV entertainer, but he is not a scientist and has at times been ridiculed by climate experts over some of his statements. Bill Nye isn't any more qualified to speak about climate change than any other non-scientist. MRC discovered his path to becoming the "Science Guy." He has a BS in mechanical engineering from Cornell University, and worked at Boeing in the mechanical engineering department. His entry into TV was not because of any science expertise, but because he won a Steve Martin look-a-like contest and began moonlighting as a stand-up comic by night. Eventually, he quit Boeing and became a comedy writer and performer on a sketch comedy show in Seattle, called "Almost Live!" The host of the show, Ross Shafer, suggested he do some scientific demonstrations in a six-minute segment and take on the nickname---you guessed it---"The Science Guy." The Earth Day Network that owns the international rights to the annual event---and the celebration of Vladimir Lenin's birth---seems to be rebranding its messaging---changing the international March for Science, aka, Earth Day, to a march for social justice, because "social justice is science." MRC says, "Nye doesn't just pass himself off as a climate scientist; he once appeared on Bill Maher's HBO program and tried to pass himself off as a behavioral scientist, saying that there would be no anti-Semitism in Europe if the Jews would bother to get to know their neighbors." And then, of course, there is the ongoing attack on biblical Creationism. He says the biblical account "hurts children." Honorary March for Science chair Bill Nye has further endeared himself to the progressive Left by his continuous attacks on the biblical story of Noah's Ark. The Seattle Times reports, "They were a patient, low-key crowd of several thousand that gathered Saturday morning at Cal Anderson Park to March for Science. They didn't seem to mind the light rain that greeted their march at noon through downtown Seattle....College students, doctors in their white coats, parents with baby strollers, your gray-haired types all marched." And they will likely continue to "march" patiently in step with the cult of Green, and the drumbeat of Bill Nye, their "Science Guy." How about this concept? Read the first chapter of Genesis. Why a march for "Science"? Is science anything new? Hasn't it been taught and received in all of our public school systems and colleges for a long time already? Have people been falling away from "science"? Why are they looking to science for the answers? I suppose they need answers. Every science experiment seems to work like this: First you have something you want to test or demonstrate, and so you have your materials, and then you have your "scientist" or whatever. He's the one who does the experiment. He's the mover. If he doesn't do anything, nothing happens. That's Science. So without the prime mover, nothing would happen....ever. That's science. From the information I've been seeing the northern hemisphere has been warming, while the southern hemisphere has been cooling. Why, I don't know. Ice is building in Antarctica, and ice is melting in the north. Why, I don't know. If you are for climate change, or global warming, you go to the north. Seems to me one can find whatever they want to find, and many just take whatever data they want, like starting at the coolest part of an earth cycle and start counting the temperature from there. The Lord can make wine out of water. He can make land out of water. He can make anything out of water, and he can make anything without water. That seems to me to be Biblical science. That's just how it works, time and time again, in the book, without any doing anything by man. It's ALL ABOUT the $$$ Honey..
Bill Nye the Science guy is a fabrication and so is Global Warming. Bill Nye followed the money, good for him, but he is the one leading people astray.